Recently, I talked with a dear young friend of mine. She’s the CEO of a fast-growing defense electronics company. What makes this company so special is their commitment to sharing God’s love in this world. What makes this young woman so special is her commitment to ensuring the company honors God in everything they do. In fact, the company backs it up with their corporate profits, sponsoring missionaries and mission projects, schools, and humanitarian missions (e.g. freshwater wells and medical care facilities) in some of the poorest places on earth. My friend and I often share prayer requests for our businesses, careers, families and friends, and one another. We don’t see one another often, but communicate regularly. As friendships deepen; trust increases and true friends are able to share their fears, dreams, and aspirations. A special blessing comes from having friends who can encourage, laugh, cry, and counsel each other. What I shared to encourage my young friend turned out to be God’s way of encouraging me. God brought Ephesians 2:10 to mind, which reads “For we are His workmanship, created in Christ Jesus for good works, which God prepared beforehand that we should walk in them.” (NKJV) When I think of this verse, I am reminded how with Christ in us, and us in Christ, we are enough. We can accomplish anything that is in God’s will. Later that morning, I headed toward the feed store while still thinking about my friend. I plugged my smart phone into charge, triggering my phone to play something from my playlist. That morning, Hello, My Name Is by Matthew West played. I learned how a young man named Jordan inspired this song through his testimony. Call it a coincidence or divine appointment, but God knew the perfect words I needed to hear. Not only to share with my friend, but to embolden my writing journey. After pulling to the roadside to wipe the tears (I cry a lot when I’m in God’s presence ad He gives me a “heart hug”), I continued my trip. Upon arriving home and unloading six hundred pounds of feed, I went to my computer and emailed my dear friend. I reminded her that God never leads us to do something He has not prepared us for beforehand. Even in making difficult decisions, God works to prepare us with His wisdom, strength, grace, and mercy. With Christ, we are enough. Because we belong to God, there is nothing He will not help us with as long as we are in His will. No matter how inadequate the enemy tries to make us feel, God knows better. As I wrote these words, I realized God was speaking to me as much as He was my friend. As a newcomer to Christian writing, I doubted everything I was attempting to do in His name. I told myself I didn’t know enough scripture, I didn’t have a degree in theology, I wasn’t a pastor. I knew I was a fair writer, but writing to invoke a purchase decision differs greatly from writing to inspire, enlighten, and instruct someone. Having worked at developing my craft over the past few years, I wondered if I could ever bring God glory with my writing. That morning, God reminded me He did not make me to be a Max Lucado or David Jeremiah. He made me to be J.D. Wininger, Christian author. In Him, I am more than enough. 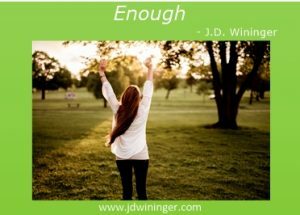 Please know that “You are Enough for God!” We can be all He wants us to be when we surrender to His will in our lives. Then, He can do His work of sanctifying us. We’ll never be perfect in this life, but with God we can all be enough. We can be the children of God He intends us to be. What a beautiful message! Yes, we are “enough”. We are special and unique because we are created by Him. I truly enjoy your messages and am sharing them on Twitter, Pinterest and my Facebook page. Thank you. Ms. Melissa. Your comments sure does my heart good ma’am. Thank you so much for your encouragement and inspiration. And yes ma’am, when we walk with Him we are all He needs us to be. Am so honored to be on that path with you ma’am. God’s blessings. And THANK YOU for sharing my posts on your social media. I try and do the same for all my followers. I believe we are the best we can be when supporting others. I greatly appreciate your support ma’am. I SO need this today, this week, this month! Thank you and the LORD for conspiring together and inspiring you to write this post. I felt a wonderful heart hug as well. Also, your “I knew I was a fair writer, but writing to invoke a purchase decision differs greatly from writing to inspire, enlighten, and instruct someone.” is a sure challenge to me as well. Thanks, friend. Thank you so much Ms. Jackie. I am a part of the Blue Ridge Christian Writers group on Facebook, and have been amazed at how many of our posts seem to have this common thread through them. In Texas we call that “… a Jesus thang!” Seems we’ve just had one with a California friend and sister in Christ this morning. God’s blessings ma’am. I guess I’ve been asking myself the “Am I good enough” question my entire life–in my career, as a wife and mother, and again, of course, as an author. You’ve made me think about it again, but not in a fearful way, but in a manner of being an extension of God’s work as He empowers me to work for Him through my writing. Your message is beautiful and encouraging–just what I needed today. I’m with you on everything except “mother” my friend. Father instead, but I sure know what you mean. I’m glad this caused you to think in a “good way”; as all your posts do to me. What a blessing you are ma’am. Thank you for being the brave woman of God you are. Am so honored to have friends like you Ms. Katherine Pasour. This is so true. I think we all struggle with doubt. And, honestly, some doubt is healthy. It keeps us looking for answers and digging deeper. But, the enemy also uses doubt to try to sidetrack God’s purpose for us. Satan sure does Ms. Kelly. One of these days I’ll share with you what I’ve come to call “The Devil’s Four Ds”, but doubt is certainly one of them ma’am. I love how you wrote “It keeps us looking for answers and digging deeper.”; I think God wants us to do that. Thank you so much for all your encouragement ma’am. What a great reminder that in encouraging someone else, we are often encouraged! I love that. I’ve experienced serious doubts about the call to write–was it God’s call or my idea? I’m grateful He’s used Scripture, family, and friends to confirm the call. Thank you for including this verse: “For we are His workmanship, created in Christ Jesus for good works, which God prepared beforehand that we should walk in them. (Ephesians 2:10 NKJV). I am amazed that He includes us in His work. Thank you so much Ms. Jeannie. I too am glad God called you to His service as a writer ma’am; your words inspire many of us. I always ask myself if I’m worthy to be used by Him. I’m not! I am ever grateful He loves using imperfect people to bring about His light in this world.